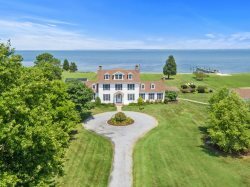 A taste of paradise on the Chesapeake—the beauty envelopes you before you walk through the door! This spacious, comfortable home includes all the amenities for a perfect getaway. Broad water views and stunning sunsets create a peaceful frame of mind for an ideal holiday. Beautifully appointed for both families and couples looking for fun, privacy and romance. The owners are pleased to provide two bicycles, two single kayaks, a tandem kayak and a canoe for you to explore the lush country lanes and calm waterways. The Oxford-Bellevue Ferry is an easy ride from here. Chesapeake Pines has a well stocked library for children and adults, a garden room with pool table, plus plenty of games and puzzles for the whole family to enjoy. A croquet set in the garage and a basketball hoop behind the shed provide more outdoor recreation. Tucked away next to the deck, is a new spa to help you unwind after a tough day vacationing. For those who must work, there is a large desk where you can (try) to focus on your work instead of the majestic water view in front of you. The open kitchen is equipped with everything you need to assemble feasts while enjoying the company of your family and friends. ****We never wanted to leave! We kayaked, biked, ran the quiet roads, fished, crabbed, swam in the hot tub and just watched the sunset every night! The layout of the house was great for having personal quiet spaces as well as a communal area. The staff at ESVR did a fine job and are always a pleasure to deal with. Good property. Some bath amenities would be good.